In the earliest Christian art, there are no depictions of Jesus, except symbolically, as the Good Shepherd and others. The Good Shepherd as an image of Jesus persisted until about 500 AD. 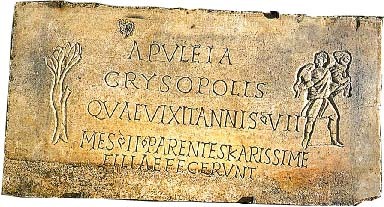 Inscription dedicated by parents of deceased 7 year old girl, Apuleia Crysopolis; Good Shepherd and bush (Catacomb of St. Callisto, Rome). Another. Gravestone for Mouses and his wife (Rome, 3rd century A.D.), Pio Cristiano Museum, Vatican. Shows Orante and Good shepherd, with a sheep at his feet. Rilievo del buon pastore, third century, Catacomb of Pretestato, Rome. 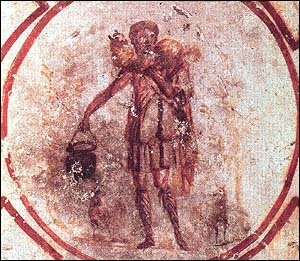 Christ as the Good Shepherd is found as a fresco in the Crypts of Lucina, ceiling of the Cubiculum of the Good Shepherd, catacomb of Callixtus in Rome (mid-third century). 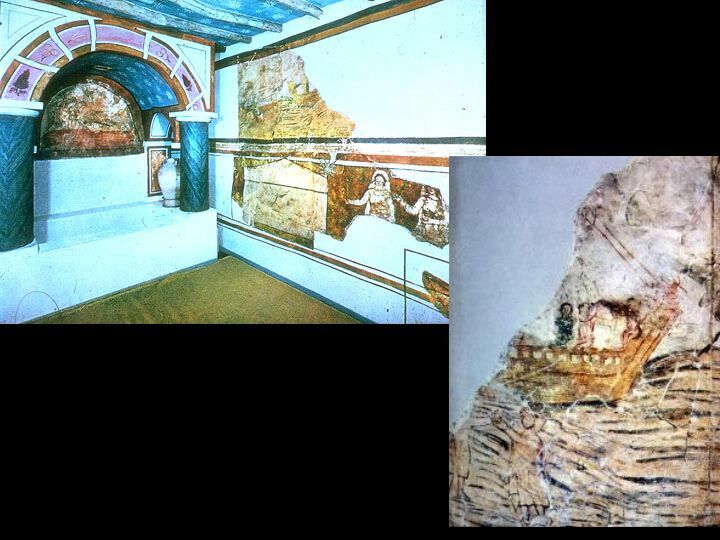 Good Shepherd, fresco, third century, Catacombs of Priscilla, Cubiculum of the "Velatio"
Good Shepherd (Buon Pastore) with two sheep in paradise, fresco Catacomb of Priscilla, third century. Another. Another. Another. A Good Shepherd wall painting decorates the room of a private house in Dura-Europos (modern Salhiyeh), Syria, adapted for the use of a Christian congregation. It would hold about 100 people, with a small platform for the bishop and a baptistry. (Moved in the 1930s to the Yale University Museum.). Another. Another. Cutaway plan. Detail of the central shepherd from the Sarcophagus of the Good Shepherd, Catacomb of Praetextatus, Rome, 390s AD. Full sarcophagus. Good Shepherd Sarcophagus, from the Catacomb of Praetextatus, Rome, 390s AD, marble. Lateran museum (later moved to Pio Cristiano Museo). Lots of grapes and vines. Detail, detail, BW, BW Detail shows angels harvesting grapes from the vine emanating from Christ. Good shepherd sarcophagus, Vatican #181, c.250-275, Rome. Another. Sarcophagus with the Good Shepherd and the Apostles, Pio Cristiano Museum, Vatican. Sarcophagus of the Good Shepherd, 310 to 315 AD, Solin, a Salonitan workship, dressed marbal. Good Shepherd and Four Seasons, early fourth century. Several depictions of Christ as the Good Shepherd. Statue of the Good Shepherd (third century), 39" high, marble, from the Catacomb of Domitilla, now in Museo Pio Cristino, Vatican. Christ as the Good Shepherd, the mausoleum of Galla Placidia, Ravenna, c. 425 - 426. Mosaic. Statue of the Good Shepherd, Third century, marble, 39"H., Rome, from Catacomb of Domitilla, Vatican, Museo Pio Cristiano. Another. Another. Another. Another. Storia Libera.it, press "continue to see more.